Home / Advice / Why Is Dancing So Good for Your kids? I f you have kids, you may be wondering what is the best way to channel their seemingly boundless energy. While traditional team sports are a good way to get your kids physically active, they may not be right for younger children. 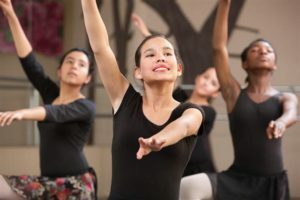 Dance classes are a great alternative to team sports, and most studios offer lessons for children as young as two or three. Participating in dance classes can be beneficial for kids of all ages. Dancing is a highly physical activity, and kids who take dance lessons regularly should expect to see a significant improvement in their overall physical health. According to Pro Dance Center, regular dance practice can increase your child’s flexibility, range of motion, physical strength and stamina. The repetitive movements involved in dance can improve muscle tone, correct poor posture, increase balance and coordination and improve overall cardiovascular health. Dancing is an aerobic form of exercise. For children who are overweight, it can potentially help them to lose weight and improve their eating habits. How To Choose A Dance StudioDancing for Kids: Should Your Child Be in Dance Class?